There’s been quite a bit going on around SketchUp HQ lately, what with the Trimble thing and the launch of our exciting new SketchUp Showcase and all. But Tyler and the rest of the Engineering gang haven’t just been sitting on their hands, either. Today, they’ve got a fresh new SketchUp maintenance build for you as well. Nothing major, but there’s some good stuff in it. …and the usual collection of performance improvements, security updates and bug fixes. SketchUp will notify you the next time it checks for an update, but if you just can’t wait, download a fresh install right now. It’s our sincere pleasure to unveil The SketchUp Showcase, a home for the most impressive, interesting, and inspiring project stories that have been shared with us. Why a new showcase? Often, when you find an amazing model in the 3D Warehouse, it doesn’t tell the full story behind a project. You can download it and see how it was built. But you probably wouldn’t get a sense of why it was built. Where did the inspiration come from? What were the design challenges the modeler faced? What happened after the model was finished? The story just isn’t complete. The Showcase is a space where the stories, images, renders, animations, and 3D models of passionate SketchUppers can shine a bit brighter. But that’s not all – the Showcase is also a first look at a new element of SketchUp technology: an online 3D model viewer. This 3D viewer lets you orbit, zoom, and pan 3D models right in your browser! To see it in action, find a project marked with a red flag or simply click here. Please note: you’ll need to use the latest version of Google Chrome to take advantage of the WebGL goodness that makes this viewer possible. Go ahead and start exploring now; content is organized by category filters, so you can easily find projects based on your interests. 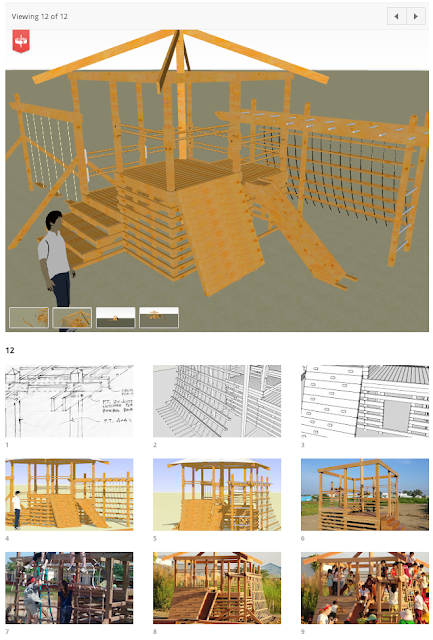 A project page featuring the new online 3D viewer | The Catalyst Playground in VietnamFinally, our team would like to dedicate the SketchUp Showcase to all the passionate SketchUppers who’ve supported us for over a decade. As we enter a new chapter with Trimble, we hope the Showcase and the online viewer are proof that SketchUp is only getting better. It’s clichéd to say we wouldn’t be much of anywhere without you, but that doesn’t make it any less true. Thank you for all of the love (sometimes tough) you’ve sent our way. Your passion for SketchUp is still what gets us out of bed in the morning. GreenspaceLive is a software and consultancy shop based on the Isle of Lewis in Scotland. The company was founded in 2008 as a spin-out from the Greenspace Research, a low-carbon building and renewable energy research program at Lews Castle College, University of the Highlands and Islands. This case study about gModeller, the company’s SketchUp energy analysis plugin based on gbXML, comes to us from Donald Macaskill, Technical Manager and Energy Engineer at GreenspaceLive. Hospitals have unique energy consumption demands. Not only do a hospitals require lighting and heating 24 hours a day, but they also require ventilation, sterilization, laundry, food preparation and important medical equipment to be powered as well. Therefore, any improvements made to the building could drastically reduce the bills, freeing up money to be spent elsewhere. The NHS Western Isles Trust are very proactive in trying to reduce their energy costs and carbon footprint. To determine their baseline energy consumption and carbon emissions and then to simulate a number of fabric and technology improvements to their largest building, they turned to GreenspaceLive. 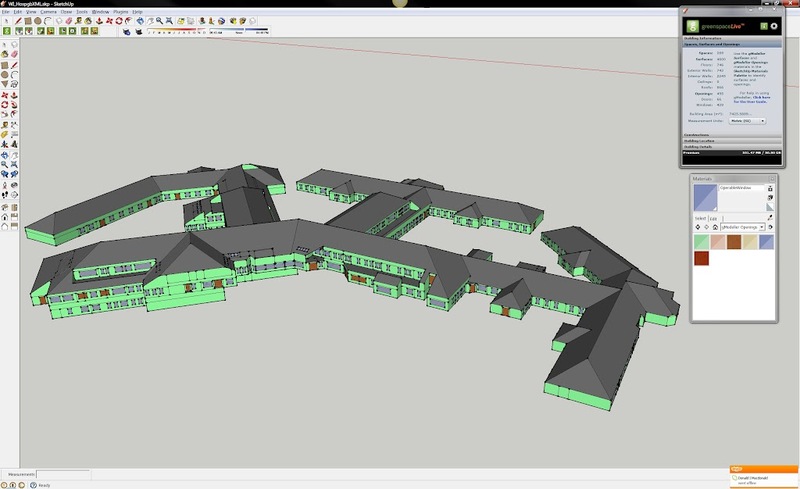 A hospital model and energy analysis workflow was created in Google SketchUp Pro with GreenspaceLive’s gTools suite. To start, existing 2D CAD models and scanned paper drawings were shared via gWorkspace. 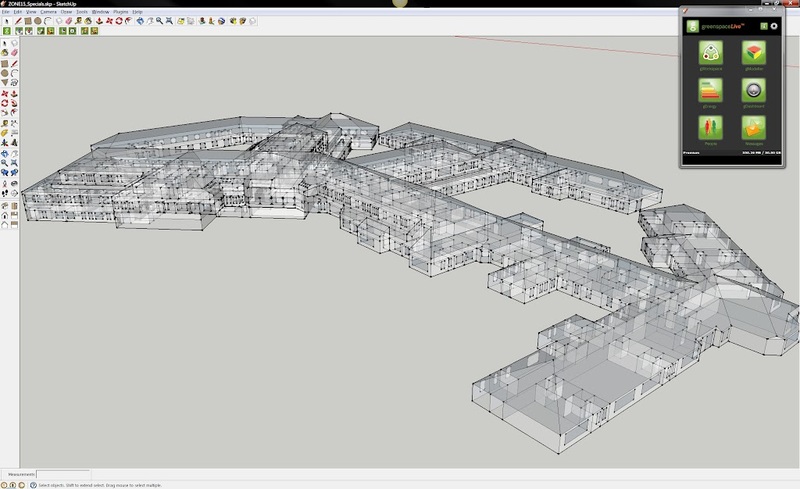 These floor plans were then imported into Google SketchUp Pro. Once the floor plans had been imported, each floor was extruded to the correct height and dimensions. A detailed model is not required for the gModeller plugin, so the model could be simplified to single faces for walls, floors and roofs. Once completed, attributes were added to the model using the gModeller’s customised materials, located within the Paint Bucket tool in SketchUp. Next, spaces were identified using the manual Space tool, which allowed the model to have zone specific information, such as heating, lighting and ventilation for different areas. The gbXML building information model generated by gModeller was now ready to be exported to an energy analysis engine. In this case, gEnergy was used, however, exported models can also be imported into Green Building Studio, Ecotect, Trace, DesignBuilder and others. gEnergy was initially run using the Hospital’s existing fabric and technologies to establish a baseline Energy Performance rating, subsequent analysis runs were then carried out with simulated improvements to the building, including proposed refurbishment changes, to determine the impact they would have on performance of the building. Once gEnergy runs were completed, the model was exported to Google Earth and presented to the clients, showing gDashboard energy results on screen while touring their model. Using the gWorkspace cloud platform, the modeling team was able to share and collaborate with the client throughout the process. Team members and client representatives were able to view, download and share files from the project, as well as view all energy runs that were undertaken. Armed with the tools and the data, NHS Western Isles Hospital were able to model different scenarios and view the impact these changes would have. The results were dramatic – making a number of changes to the heating system, the team was able to demonstrate that the most effective change would result in over 50% energy savings, while reducing the CO2 emissions by almost 80%.